Follow Sparky as he teaches fire safety to a group of little animals—and has some fun along the way! Meet Sparky. This adorable Dalmatian puppy is an important member of the team at the fire station. But he's more than just a cute character: Sparky is the official spokesdog for the National Fire Protection Association (NFPA), and what he has to say can save lives. This canine hero rescued a little girl and her family, and now he's helping kids become junior fire inspectors right in their own homes. 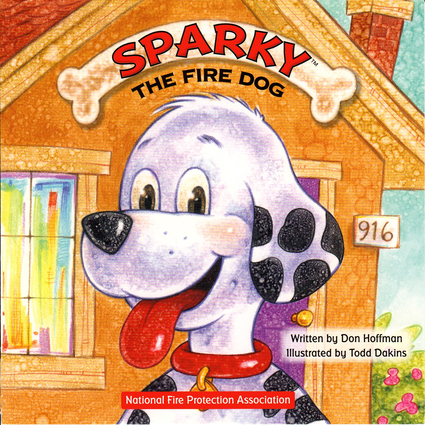 In colorful, appealing illustrations, Sparky takes a group of young animals through the neighborhood, pointing out hazards, giving basic fire safety tips and showing them how to be prepared in case of an emergency. From having a working smoke alarm to being careful with candles and knowing where your exits are, Sparky's advice may be the most important thing children, and their parents, ever learn. Don Hoffman is an Emmy Award-winning children's book author and a Society of Children's Book Writers and Illustrators (SCBWI) fellow. His published stories reach back to 1999, with successful titles for leading publishers Charlesbridge/Imagine, Dalmatian Press, and Popcorn Press. Learn more about Don Hoffman at donhoffmanauthor.com. Todd Dakins is an award-winning children's book illustrator.